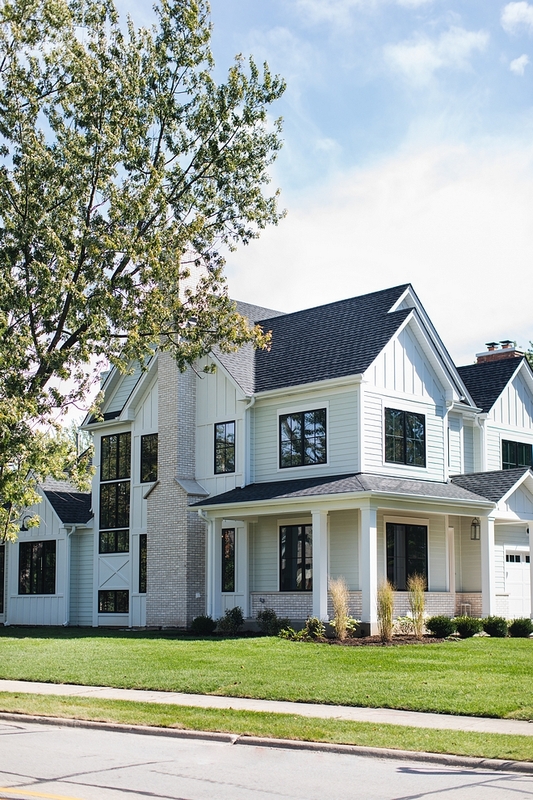 Now, let’s talk about this stunning corner lot modern farmhouse?! First off, just look how beautiful the day seems. I see the blue skies, the trees with leaves and that alone is making me happy. 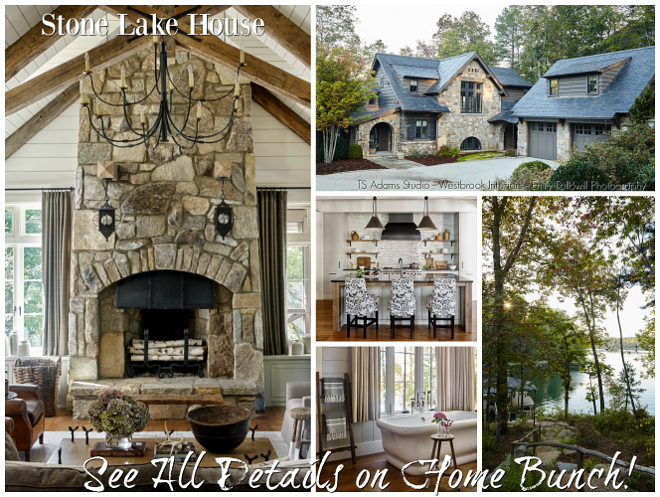 Add the beautiful architectural details and you have a great home to be inspired by. 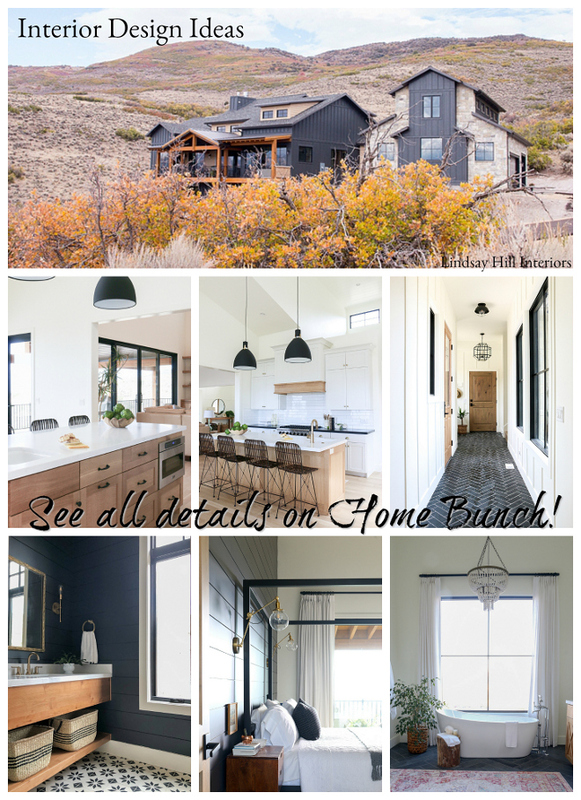 Built by M House Development (recently featured here & here), this newly-built modern farmhouse is being featured to inspire and give you new ideas if you’re thinking of building your dream home or renovating your existing one. 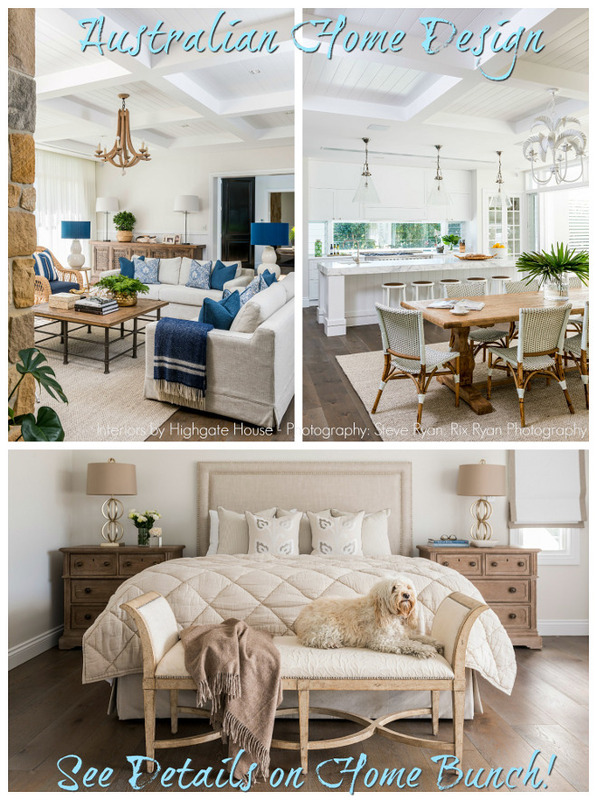 Take notes on all sources shared by this talented builder, from flooring to lighting, paint colors and much more and, of course, as always, feel free to pin your favorite interior pictures! 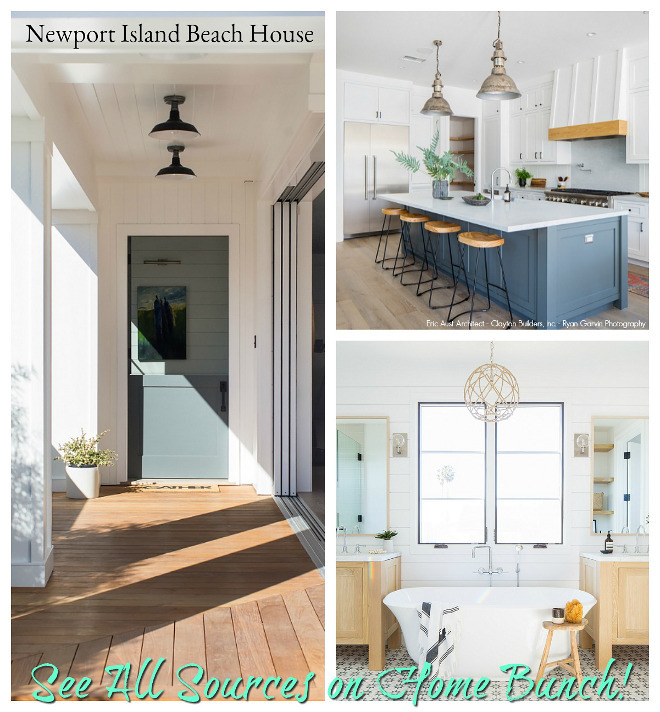 This home is not big and it could work on almost any lot – not only on a corner lot. 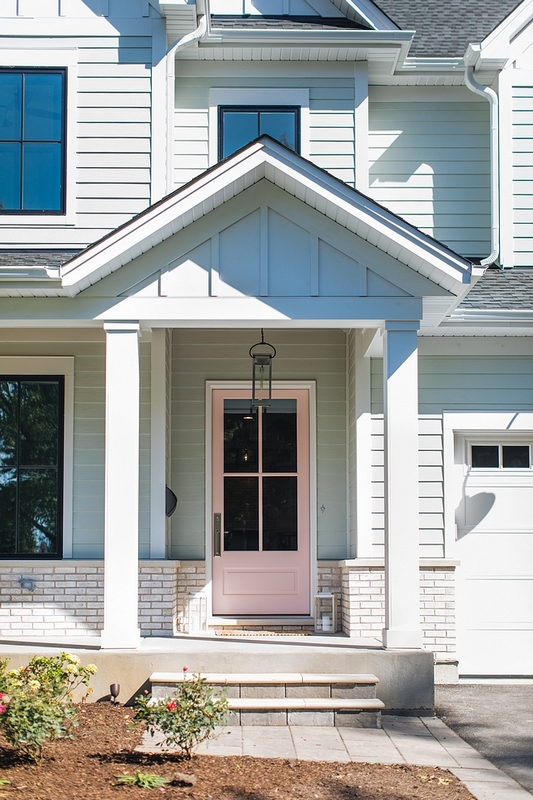 Notice the board-and-batten siding, the front porch and the brick accent, which really gives this home a timeless feel. Gooseneck Lights Over Garage: Troy Lighting. 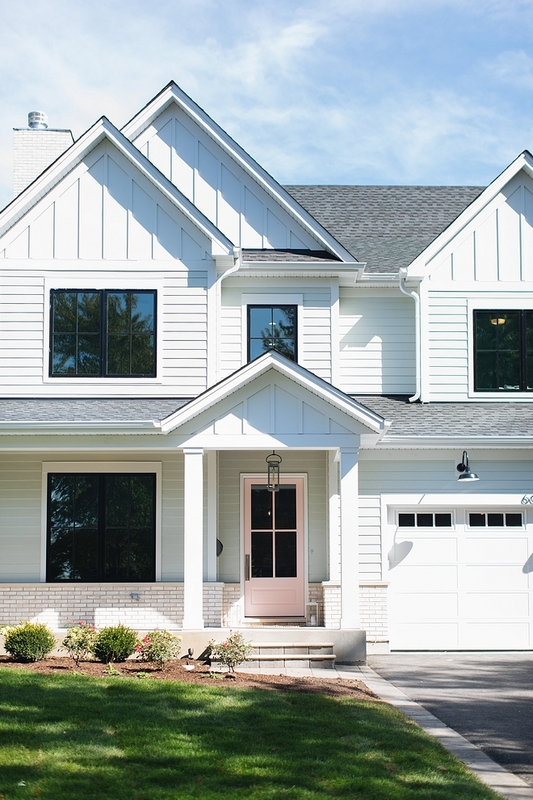 Siding is Sherwin Williams SW 6204 Sea Salt. The black windows are Pella. Exterior brick is Sioux City Brick Casablanca. Gooseneck in peak: Troy Outdoor Wall Sconce. 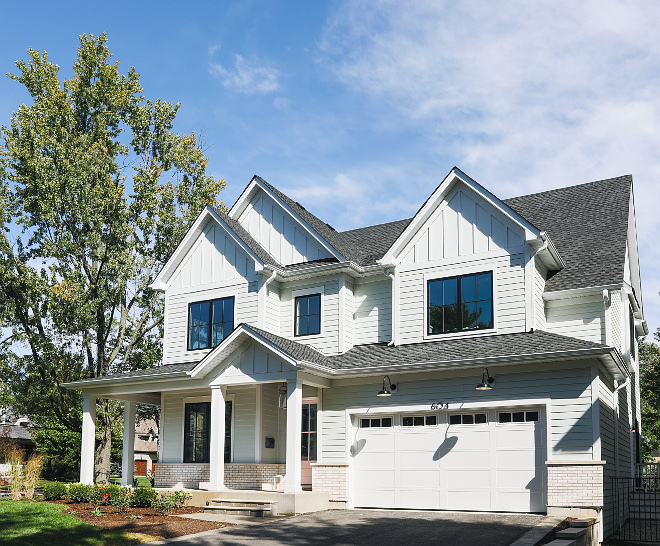 The white siding, including board and batten, are James Hardie Arctic White. 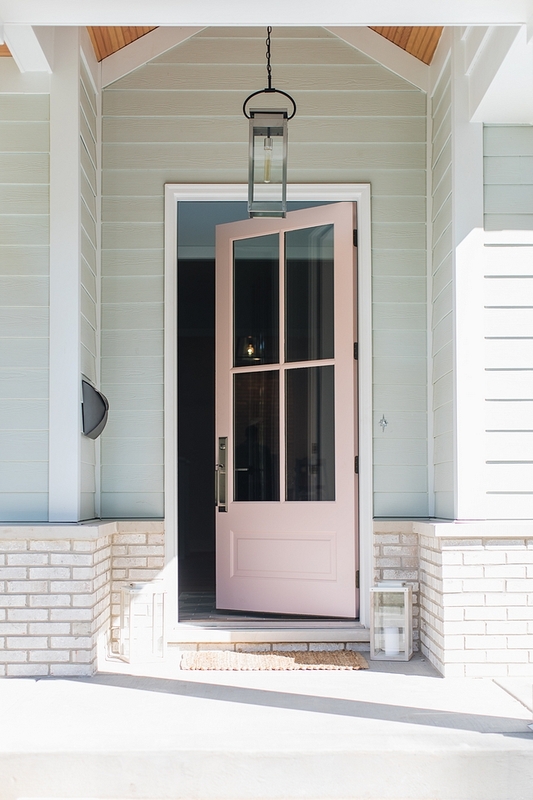 Millennial Pink Front Door: Sherwin Williams SW 6316 Rosy Outlook. Exterior Pendant Light: Progress Lighting. 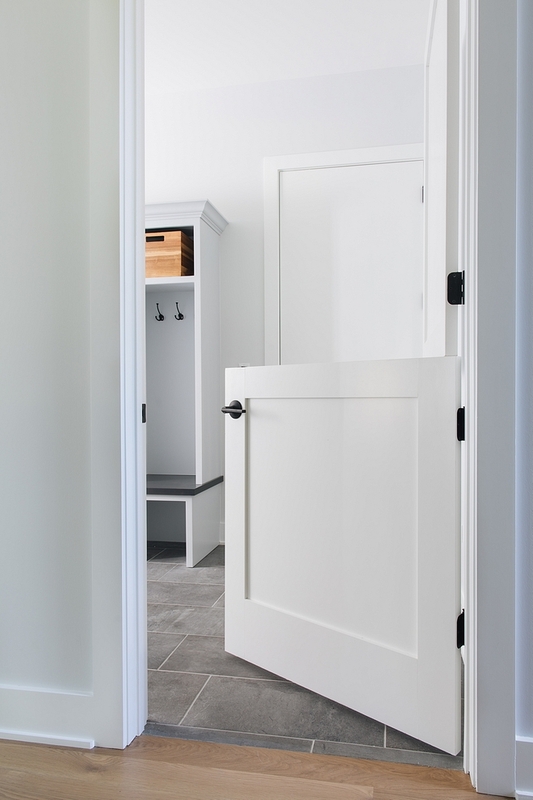 The front door, painted in Sherwin Williams Extra White on the interior, opens to a foyer with high ceilings and hex tile runner. Floor Tile: Attitude Hexagon Matte 8.5x10 – similar here. Lighting: Millennium Lighting 3254 4 Light 20″ Wide Foyer pendant. 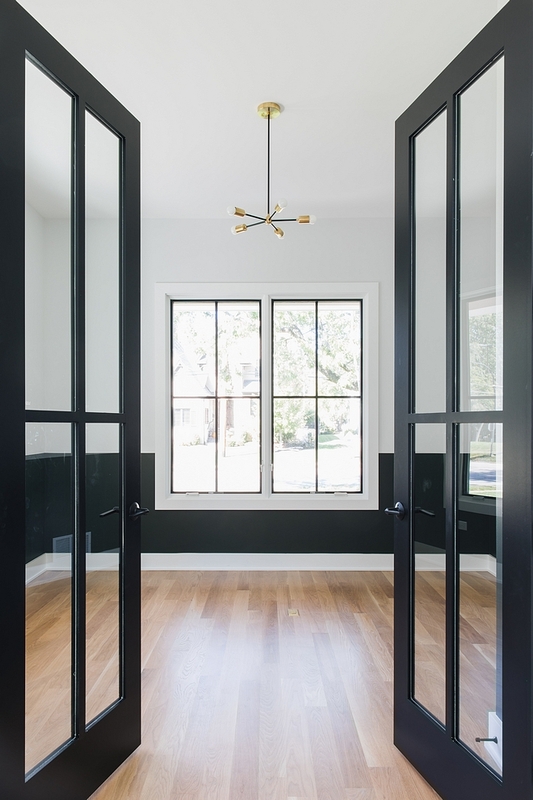 The black doors are painted in Sherwin Williams Tricorn Black. The study features two-toned walls and a modern chandelier. Paint color is Sherwin Williams Ripe Olive SW 6209 on lower part of walls and Sherwin Williams Site White on upper part of walls. 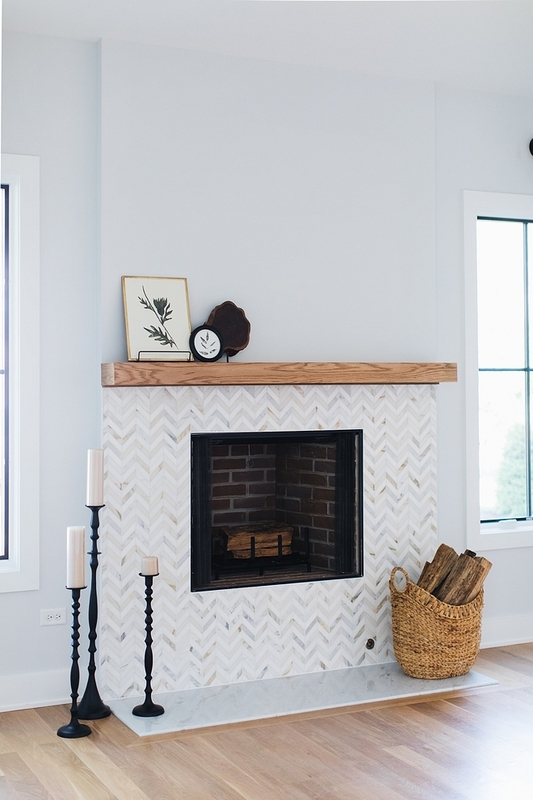 A fireplace with chevron marble mosaic tile and beam mantel is the focal point of the family room. Beautiful Mosaic Tiles: here, here, here & here. 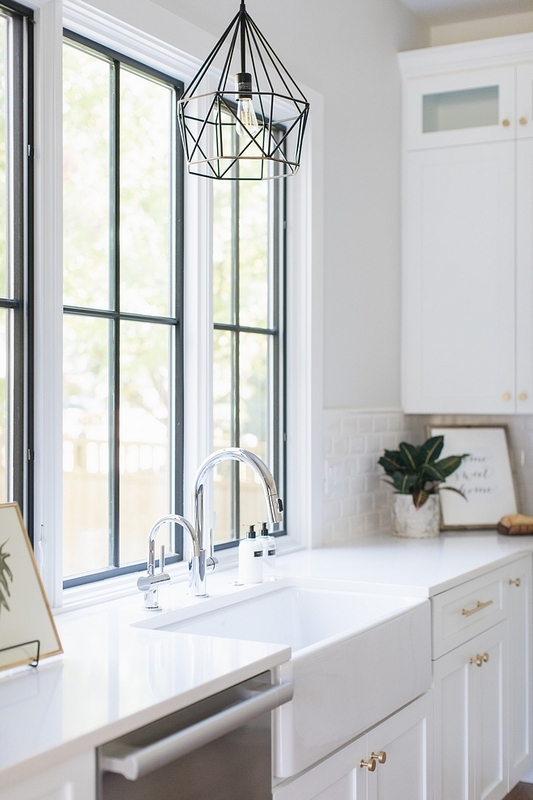 This kitchen is adorable from every angle! Wall color is Sherwin Williams Site White. 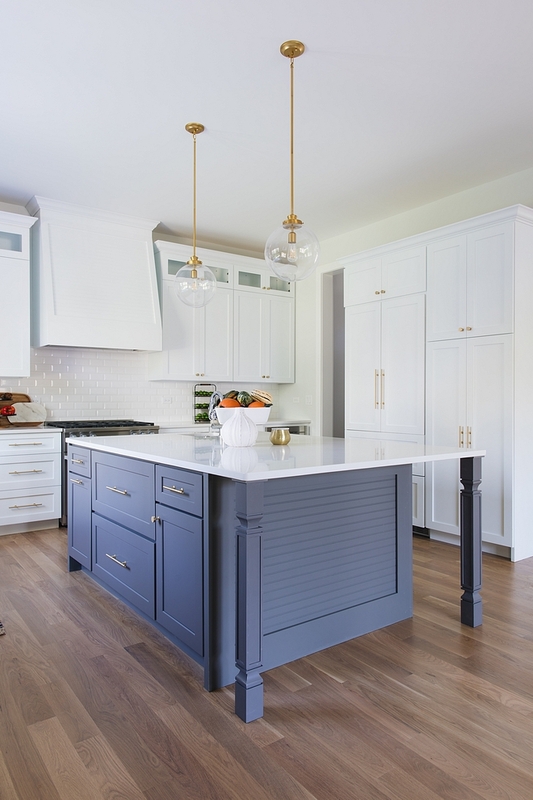 The shaker-style cabinetry is painted in Sherwin Williams Extra White SW7006. 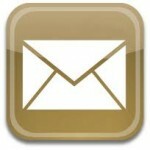 Range: Miele – similar here. 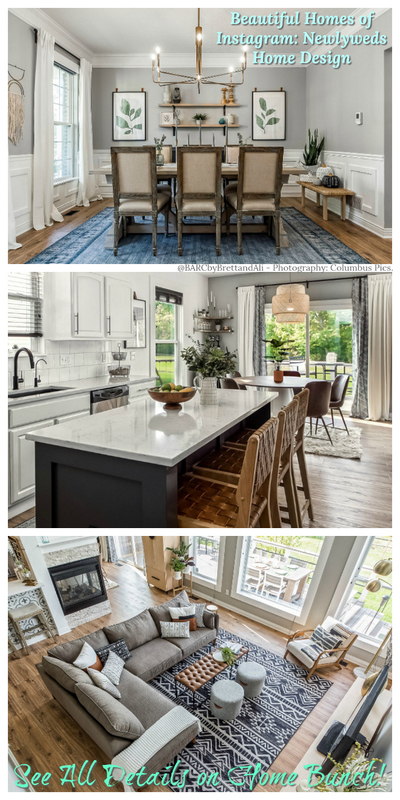 The hardwood flooring throughout the home is 4″ field finished white oak with Pickled Oak stain – similar here – Other Beautiful Hardwood Flooring: here, here, here & here. 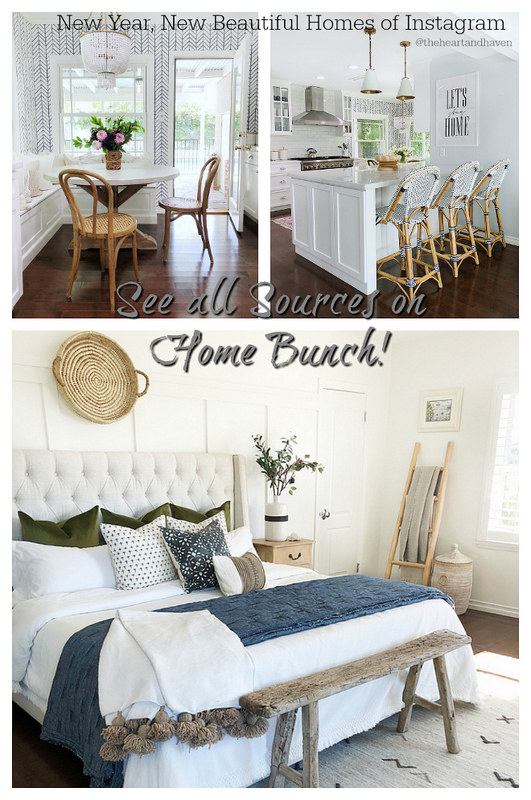 Kitchen Hardware: Lewis – Similar knobs & Round bar pulls. 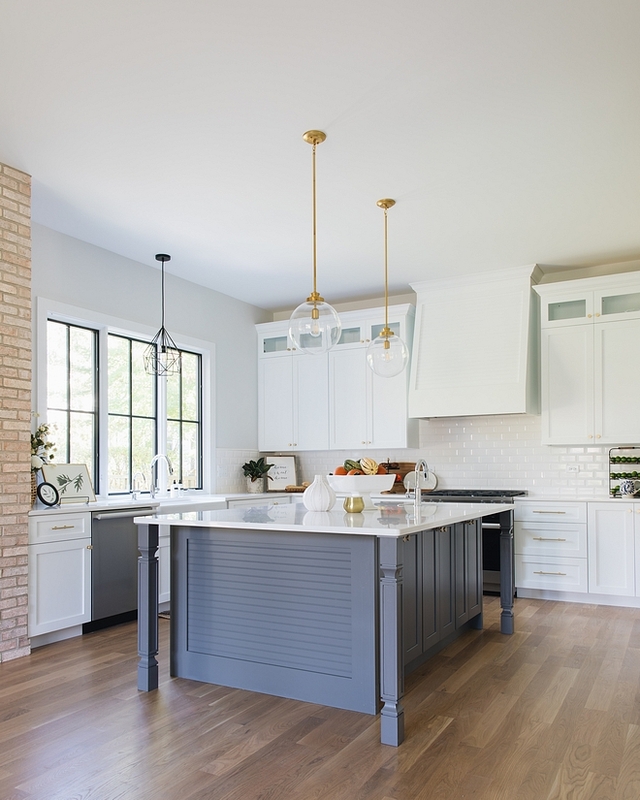 The kitchen countertop is Perla White Quartz. Pendants: Progress Lighting. 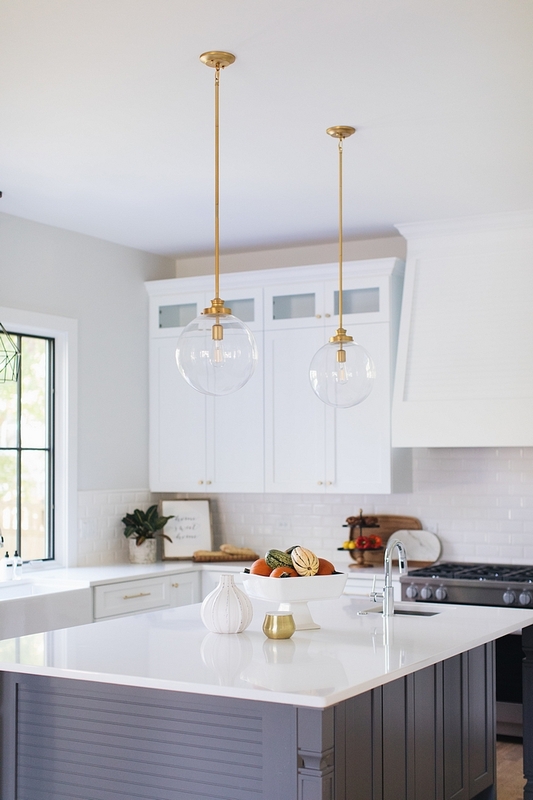 These clear glass globe pendants are timeless and affordable! 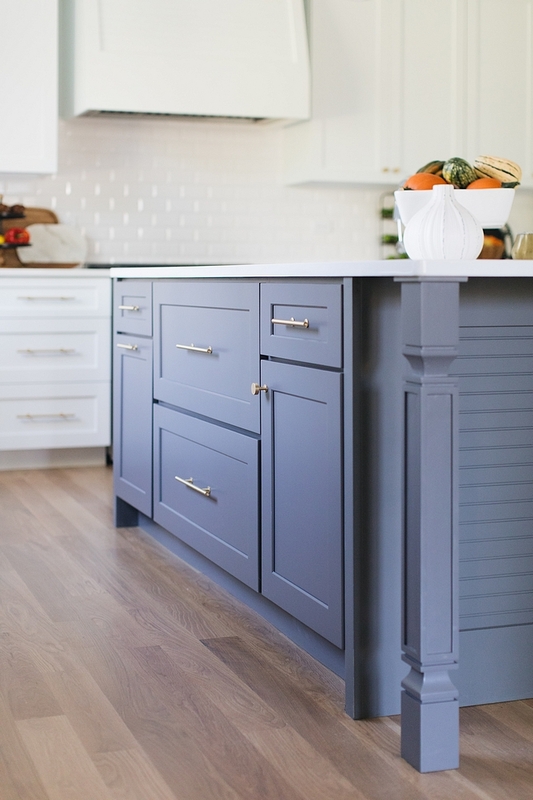 The kitchen island features a custom gray color. Unfortunately, the island looks like it had a blue-ish tint or purple. In person, the island is actually a gray color. 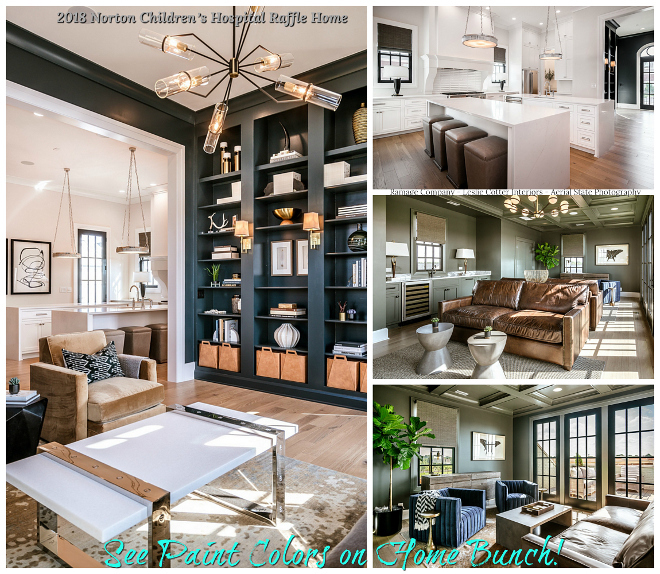 If you like the color you see above you can give Benjamin Moore Normandy a try! That’s a similar color to what we see above. 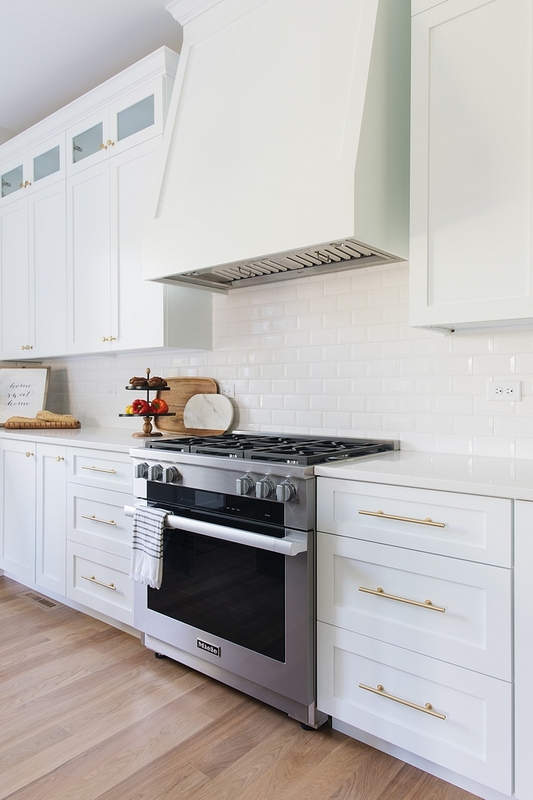 Kitchen Backsplash: Sonoma Tiles – 3×6 Bevel Square Edge Field Pure White Glossy. Similar “Home-Sweet-Home” Sign: here & here. Kitchen sink is Kohler. Notice the beautiful black windows. 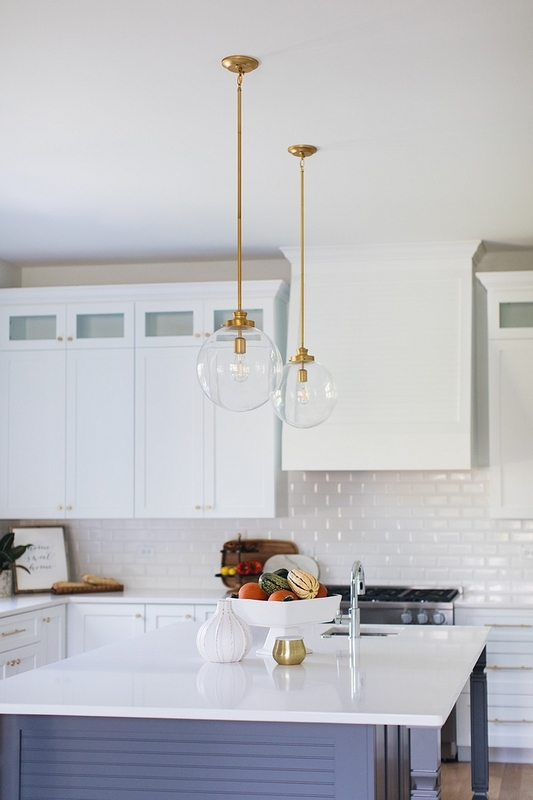 Similar Pendant Lighting: here & here. 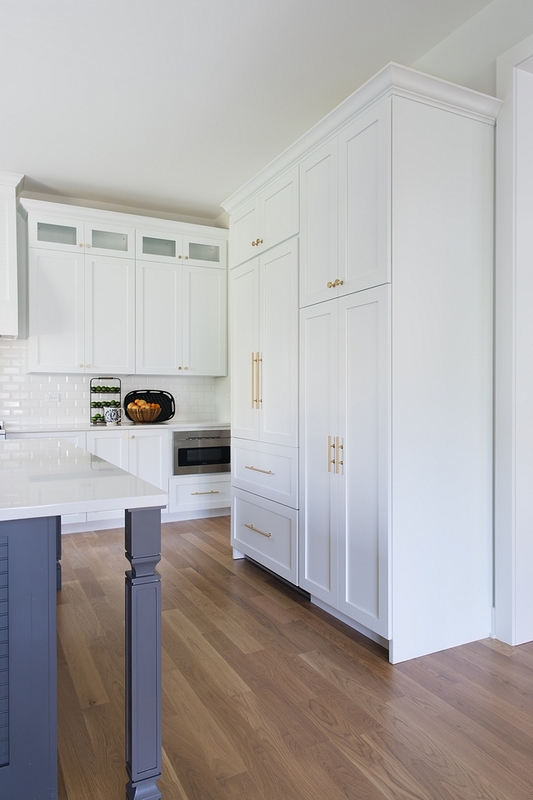 Cabinets are custom shaker-style, Maple. 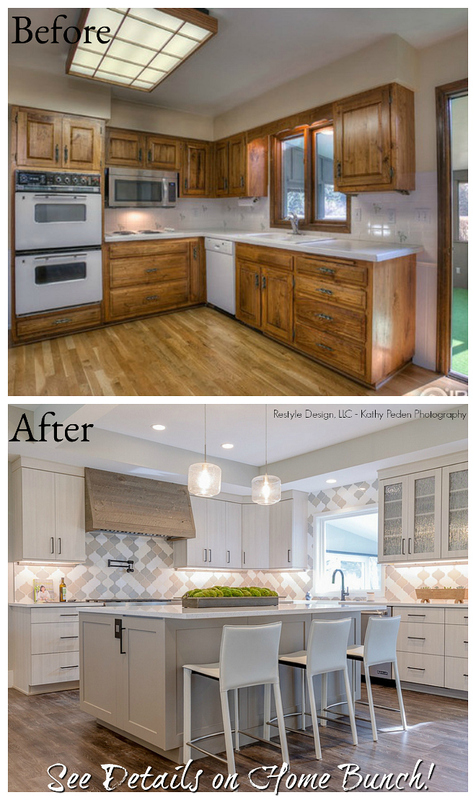 Kitchen Runner: Here (different size) – Other Beautiful Kitchen Runners (You can easily change the tired feel of your kitchen with a new runner. 🙂 ) Neutral Runners: here, here, here, here, here, here, here, here & here. 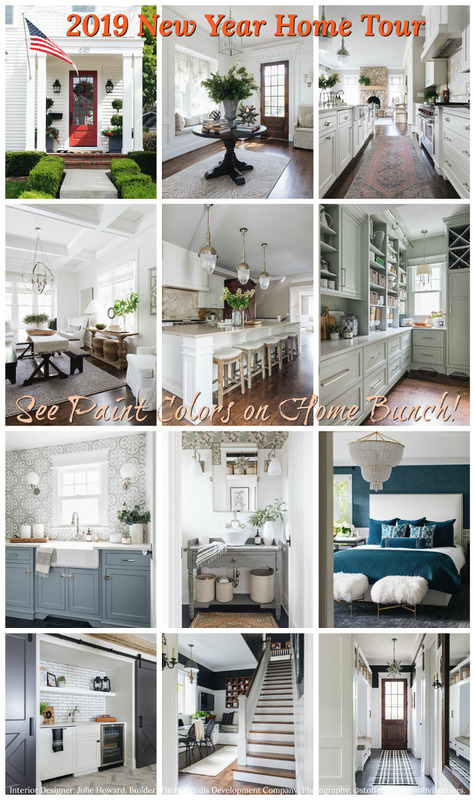 Pop-of-Color Runners: here, here, here, here, here, here & here. 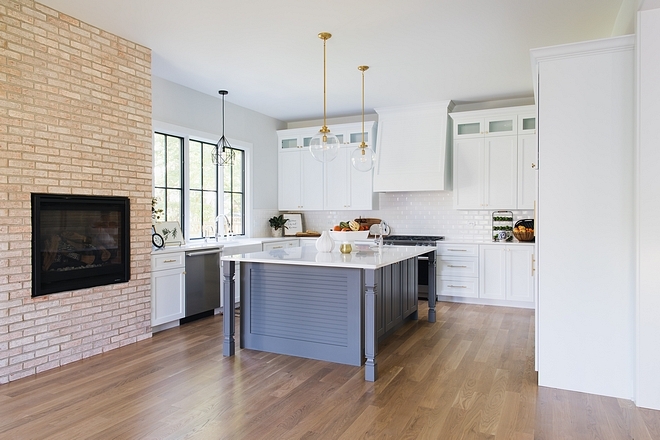 A brick fireplace brings warmth and a rustic feel to this kitchen and dining area. Dinette Accent Paint Color: Sherwin Williams SW 6244 Naval on window wall (Sherwin Williams Site White for the remaining walls). Lighting: Ink & Ivy Cyrus Gold Chandelier. 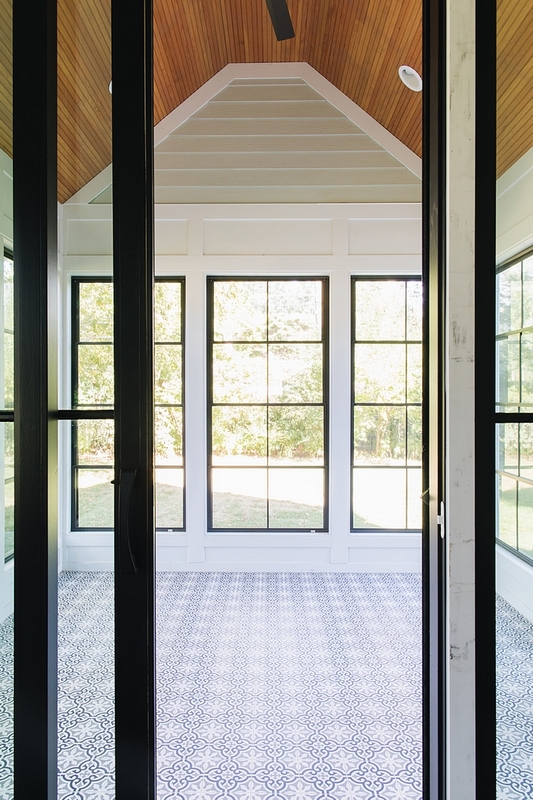 The dining area opens to a beautiful sunroom with black windows, Cedar beadboard ceiling and cement tile. I am loving this combo! 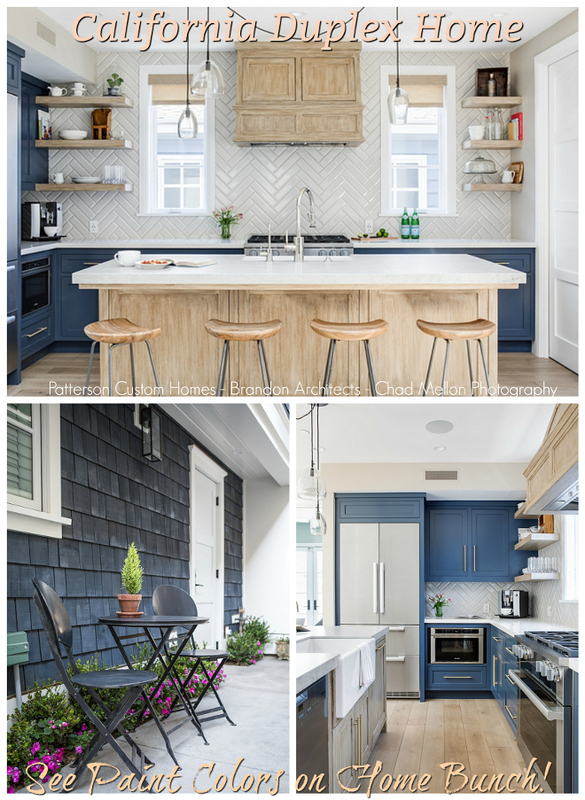 Flooring: Havana 8×8 Cement Tile Blues – similar here, here, here & here. 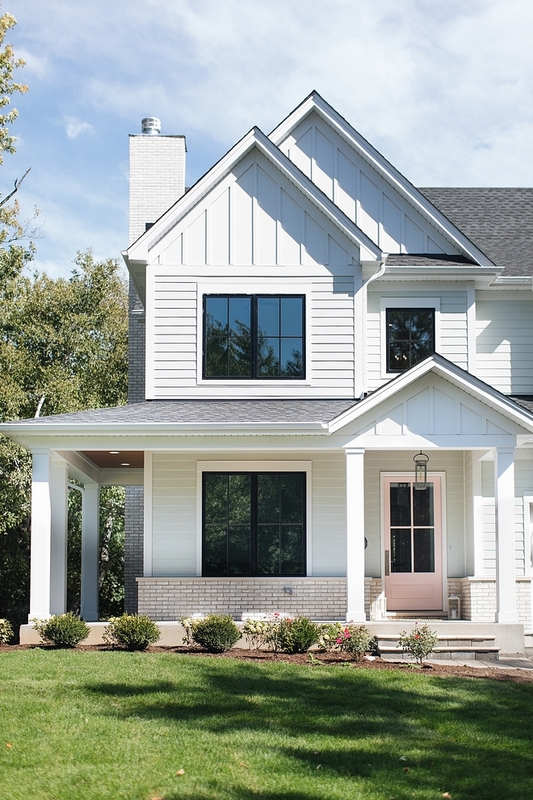 Trim paint color throughout the house is Sherwin Williams Extra White SW 7006. 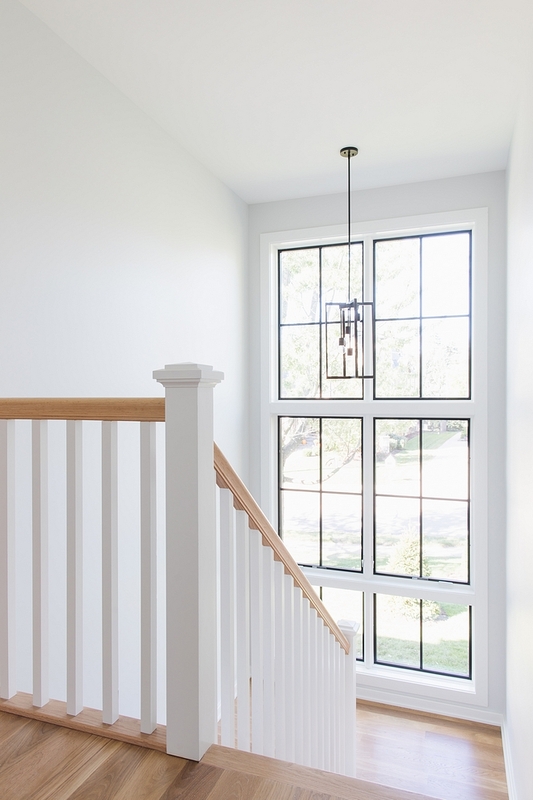 Floor-to-ceiling windows bring plenty of natural light to this stairway. Wall paint color is Sherwin Williams Site White. 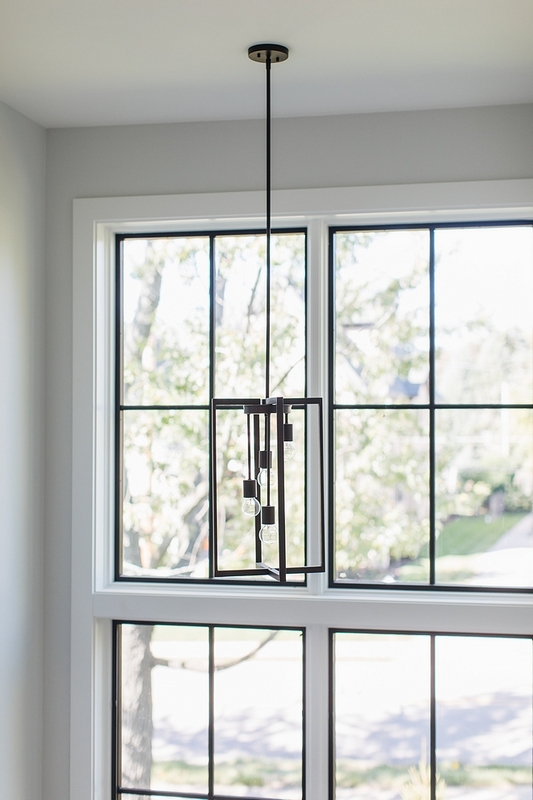 Lighting: Artcraft Lighting AC10414 Gastiwb 4 Light Mini Chandelier. Wall Paint Color: Sherwin Williams Extra White. 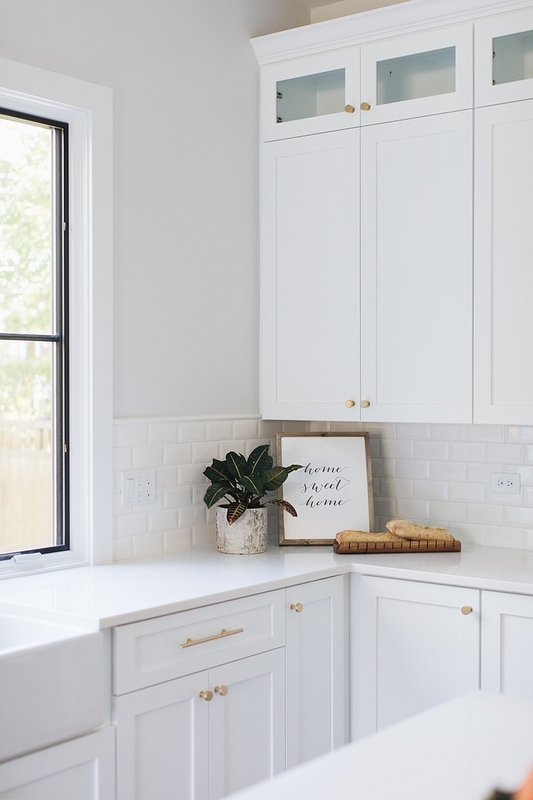 Laundry Countertop: Stellar White Quartz. 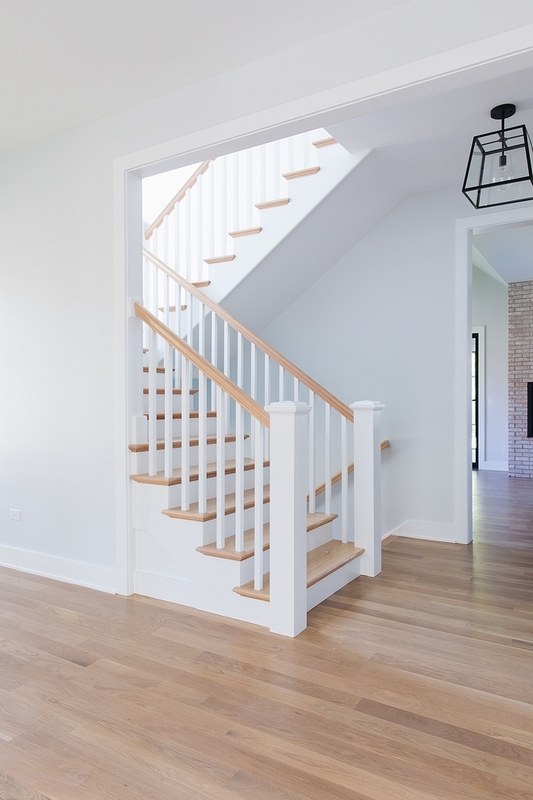 Flooring: Touch Rectified Matte 12×24 Pearl Essence – similar here. 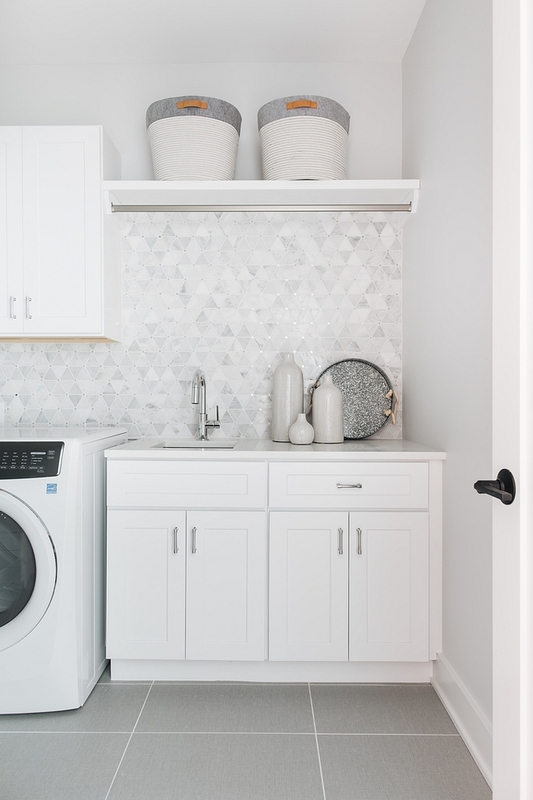 Laundry Backsplash: Marble & Silver Mirror Dot Marble Mosaic Tile. 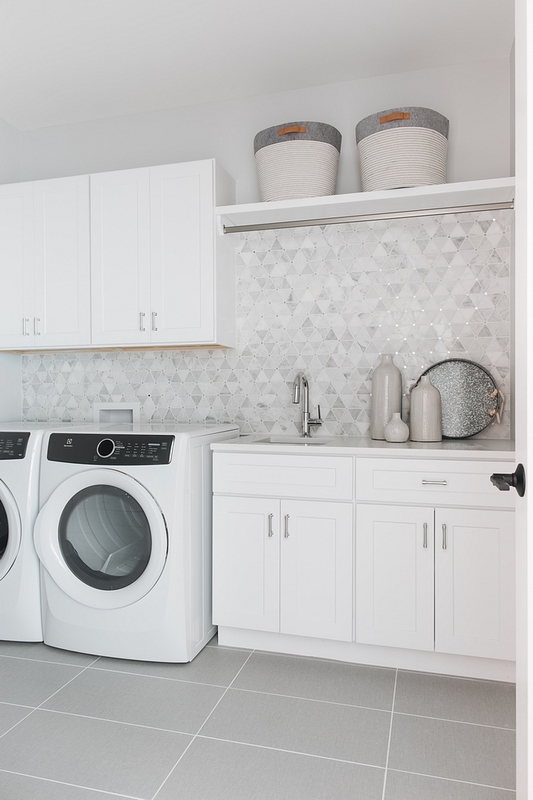 Laundry Room Hardware: Pottery Barn. Lighting (not shown but beautiful and affordable 🙂 ): Wayfair. Now, here’s the surprise! This custom cabinet feature drying racks inside. The builder’s cabinet maker cut some plastic square grid to fit inside of the drawers. 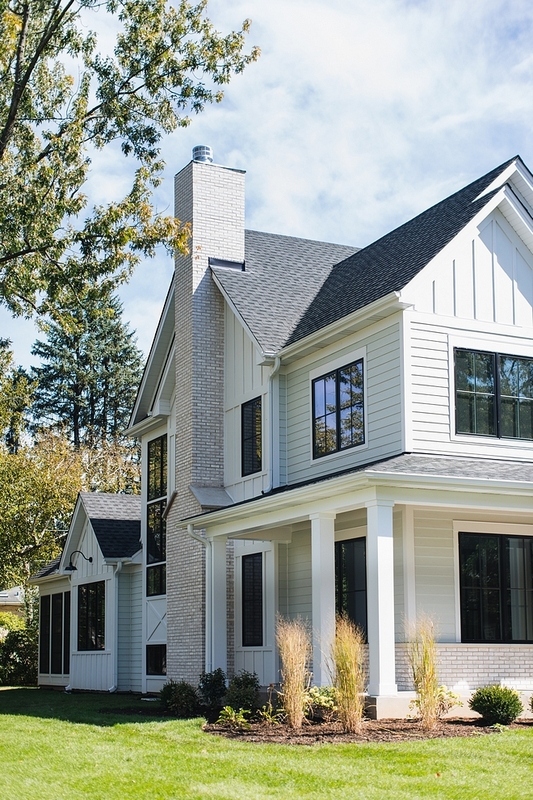 Wall Paint Color: Sherwin Williams Site White SW 7070. 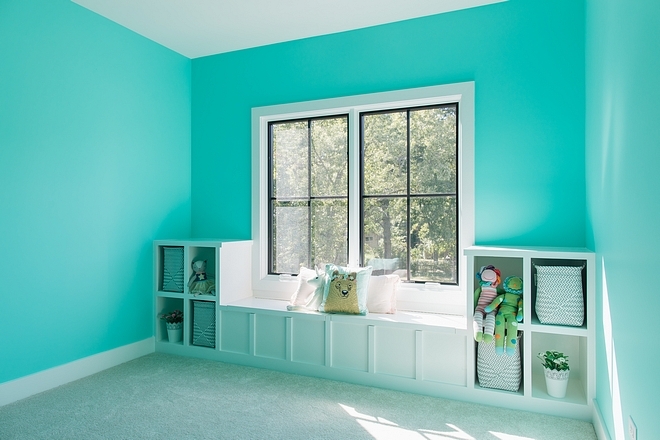 Turquoise Paint Color: Sherwin Williams Tantalizing Teal SW 6937. 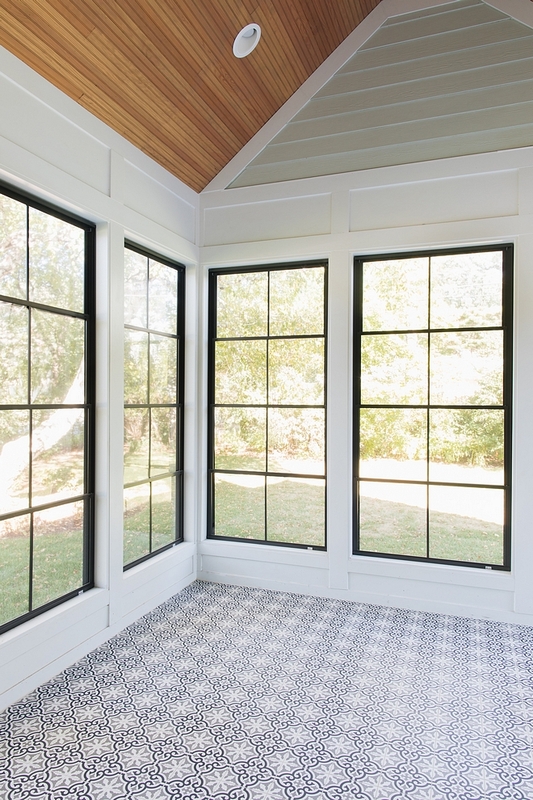 The window-seat features a board-and-batten detail. 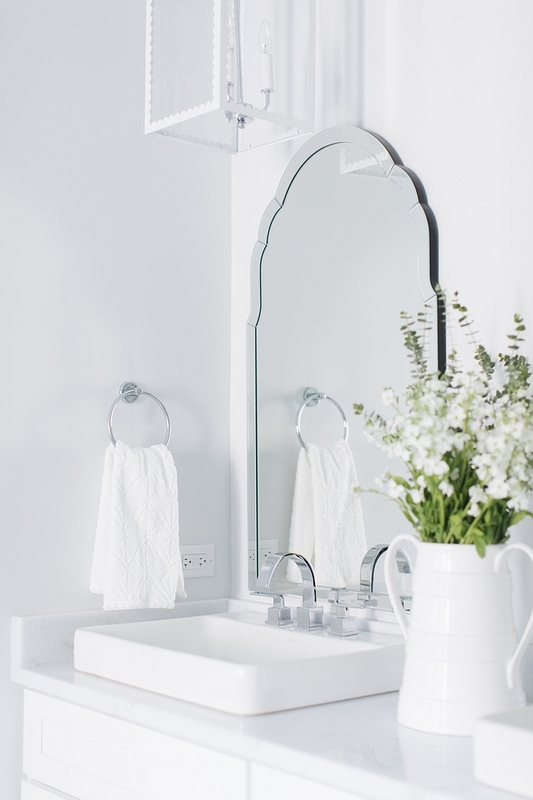 The master bathroom feels serene and calming. 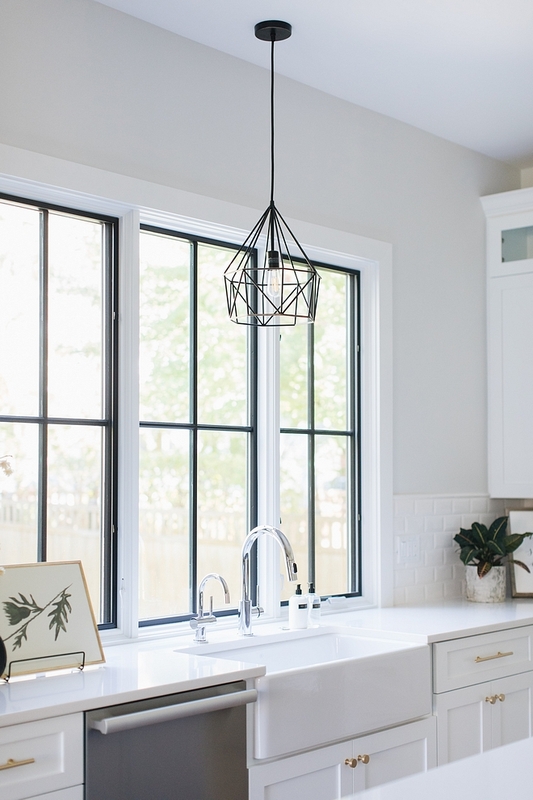 Countertop is Marma Blanca Onyx (White Onyx). 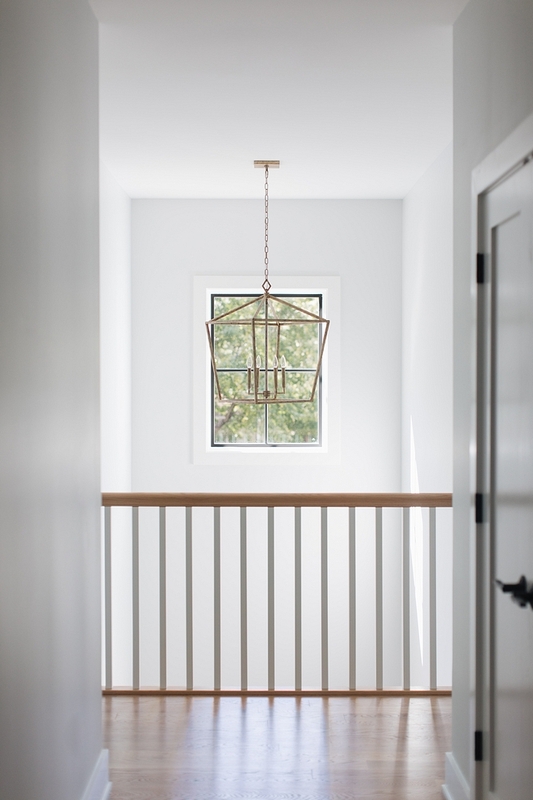 Lighting: Shades of Light Scallop Trim Hanging Lantern – similar here. 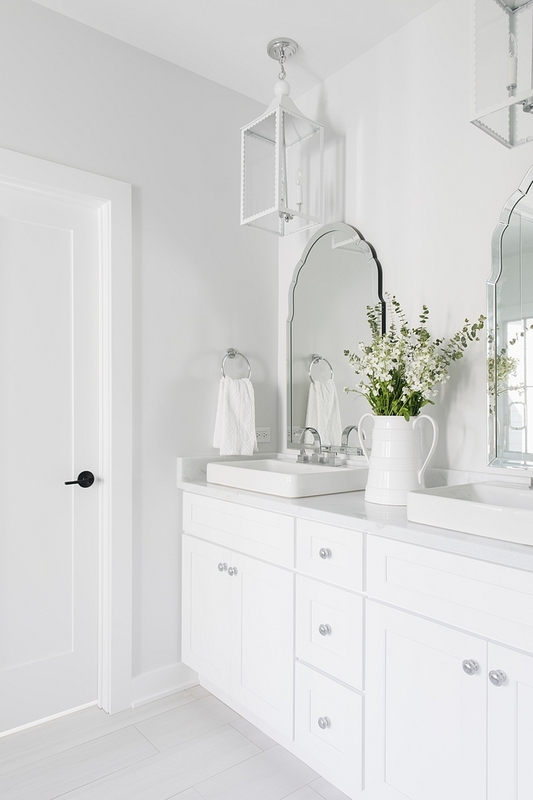 Bathroom cabinet is painted in Sherwin Williams Extra White. 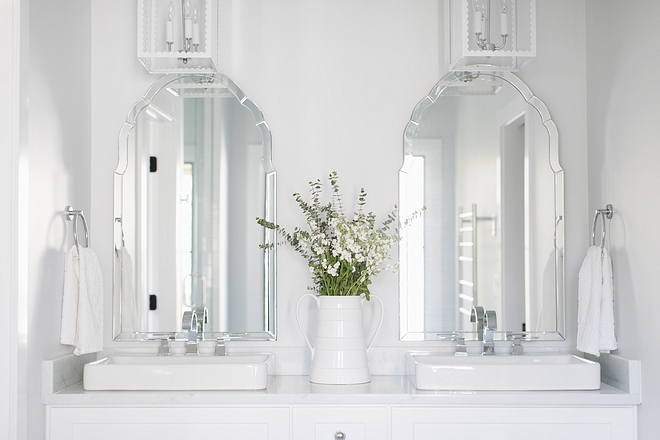 Bathroom Mirrors: Uttermost – Other Beautiful Mirrors: here, here, here, here, here & here. Floor: Classic Hexagon White Matte. 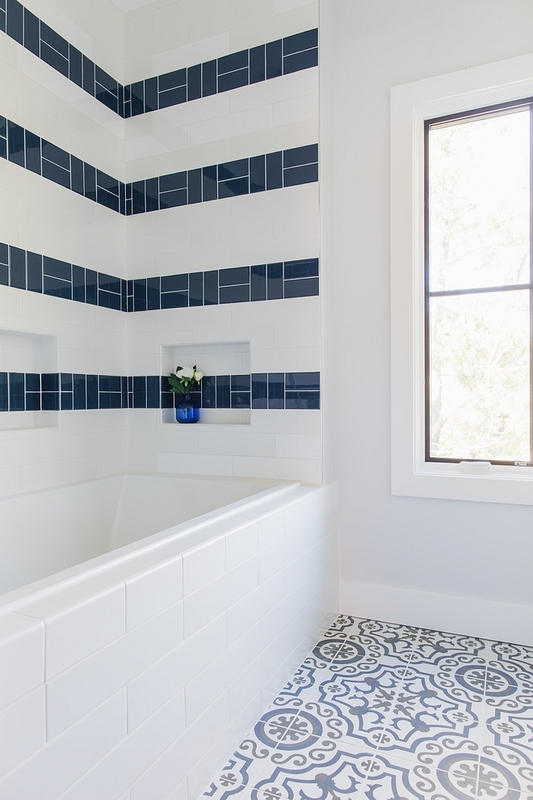 Tile: Soho Tile 4×16 White Glossy – similar here. 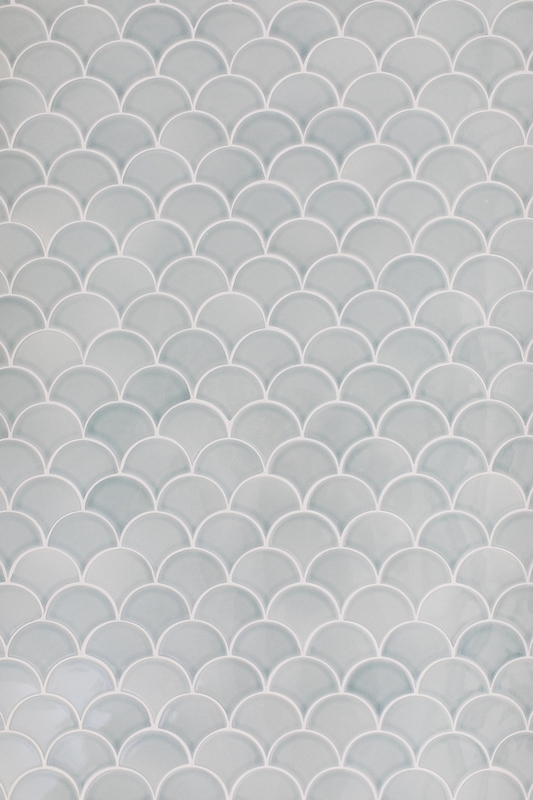 Accent Tile: Caicos Stellar Glaze Square Edge Damask – similar here & here – Others: here & here. 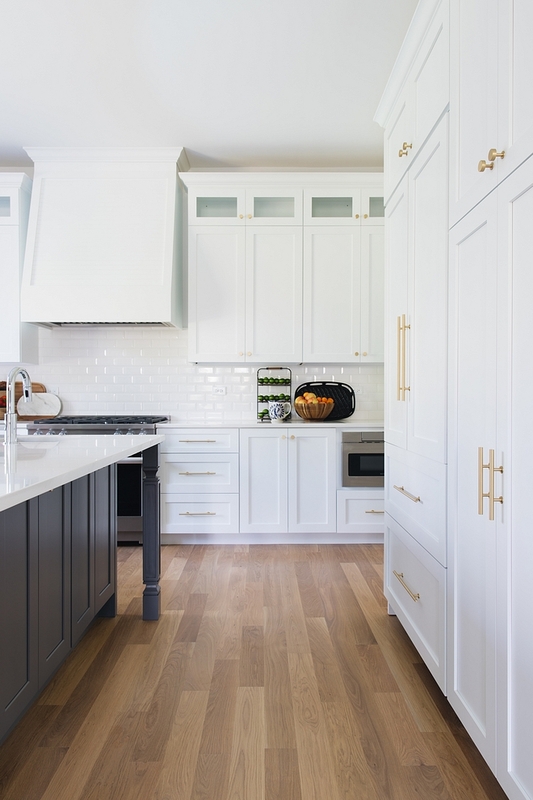 Flooring: Rosendal Floor Porcelain Alabaster Motif – similar here. 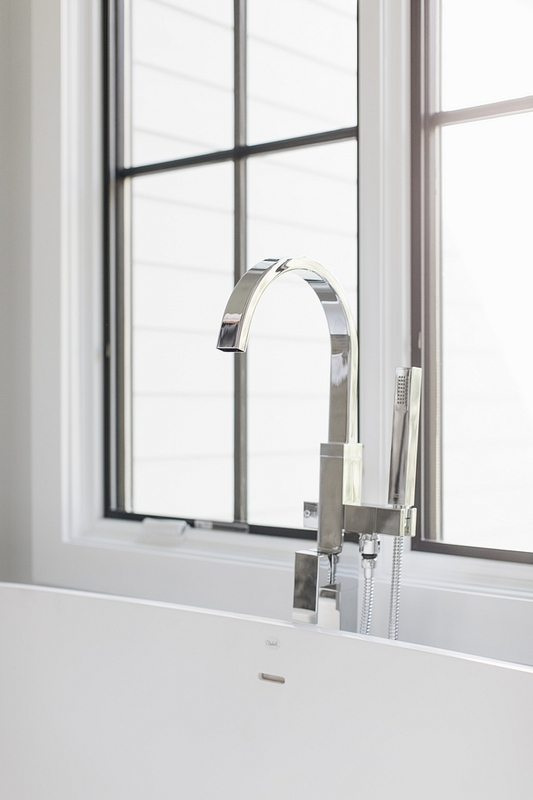 Freestanding Tub: Here – similar. 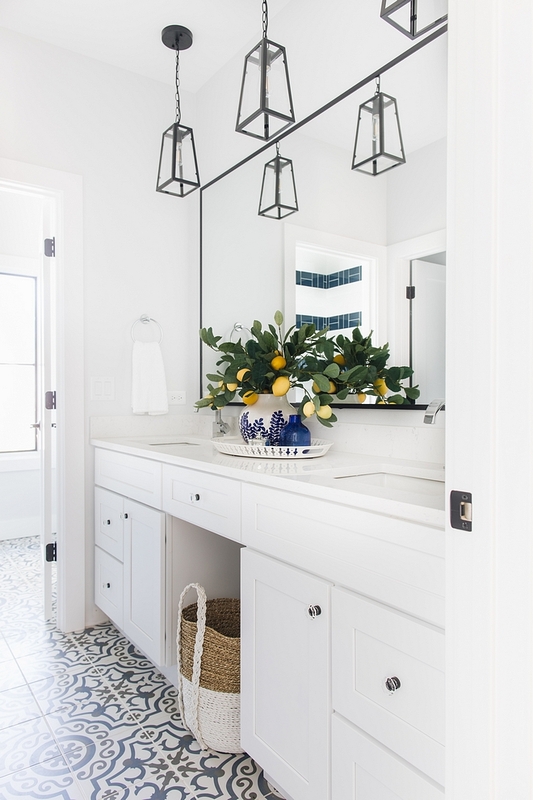 This is definitely a new take on Jack-and-Jill bathrooms! 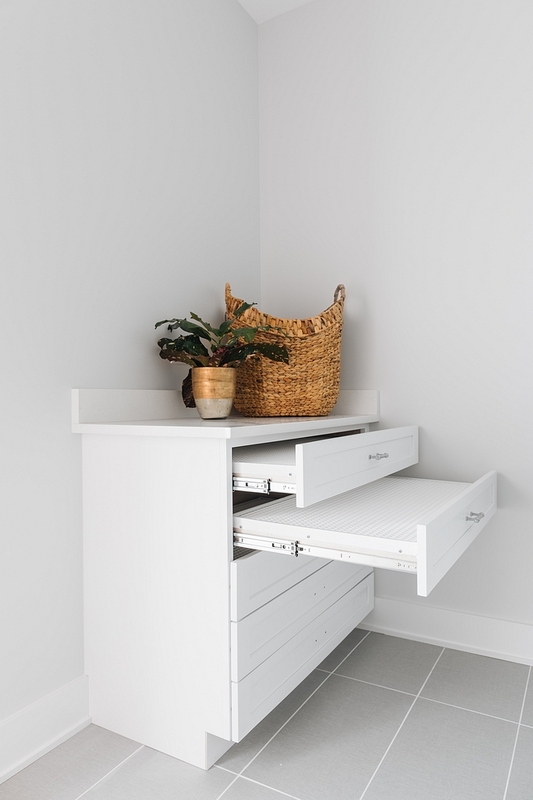 This space has plenty of character and the kids definitely won’t outgrow it. Countertop is Fairy White Quartz. Glass Knobs: Amerock Glass knob. 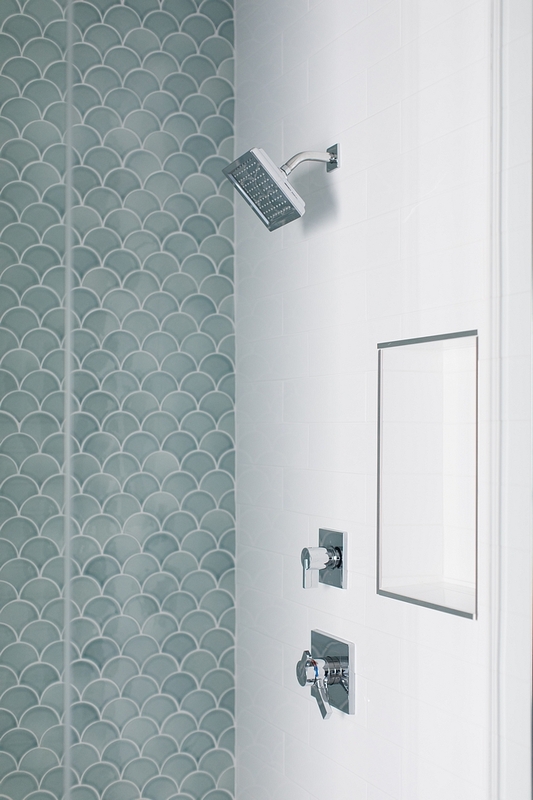 Wall Tile: Soho Tile 4×16 White Matte & Daltile Rittenhouse Square Field Tile 3×6 Galaxy Glazed. 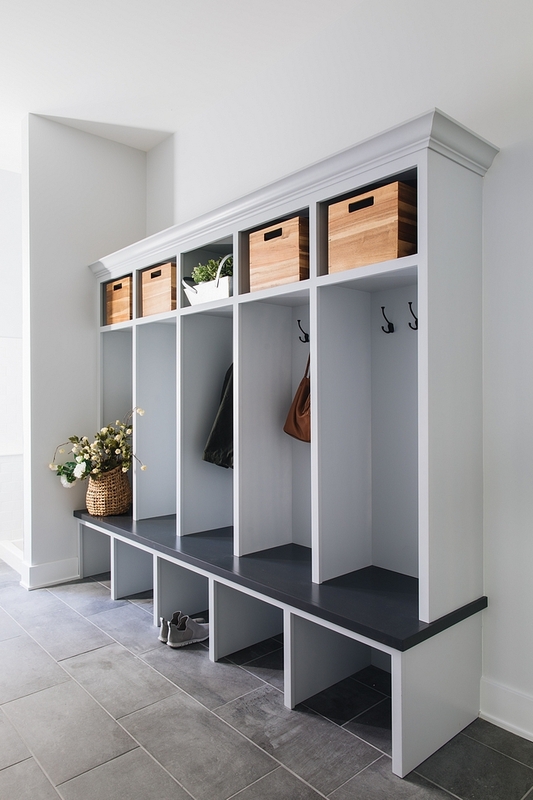 The mudroom paint color is Sherwin Williams SW 7070 Site White. 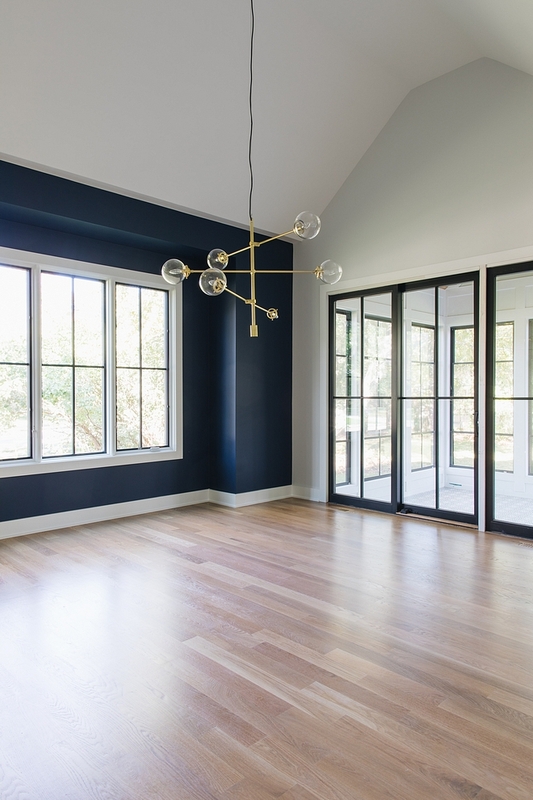 Flooring: 12 x 24 Nero Tile – durable! 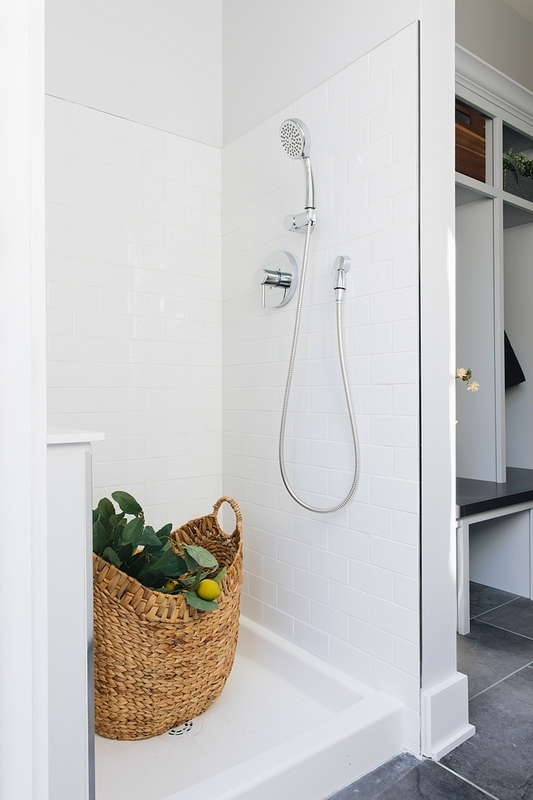 Base Shower: Here – similar. 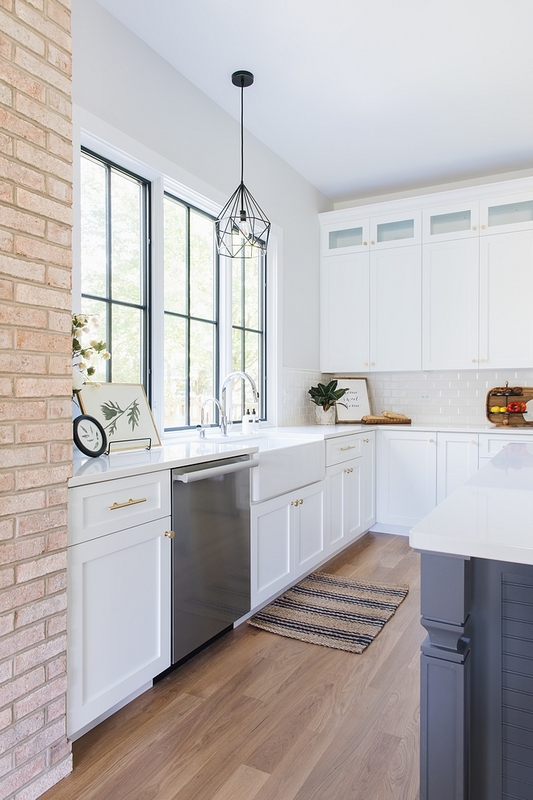 Matte White Subway Tile: Here – similar. Hand Shower: Here – similar. Many thanks to the builder (and Lindsay! ) for sharing the details above. 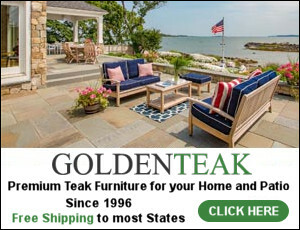 Wayfair: Massive Rug Sale! 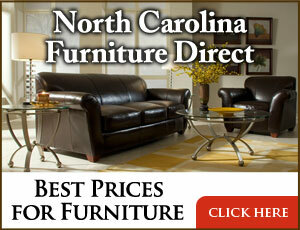 Up to 75% OFF! Anthropologie: Extra 50% OFF Sale Items! Corner Lot New-Construction Home Ideas.